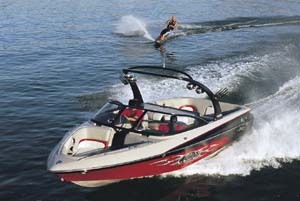 The Malibu Wakesetter 20 MXZ packs a lot features into a relatively small package. 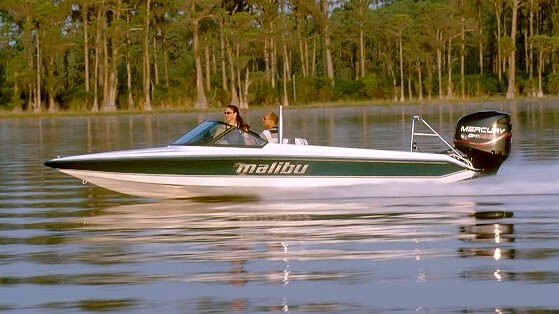 Billed as “the little giant,” Malibu’s Wakesetter 20 MXZ is big in many ways, even though it’s significantly smaller than models like their 247 Wakesetter LSV (which made our list of the 10 Best Tow Boats for Water Skiing and Wakeboarding). Still, it is in all ways a fully-featured, premium tow boat for demanding riders. The 20 MXZ isn't large, but it doesn't have to be; Malibu fits everything you need - and everything you want - inside. The 20 MXZ is designed to be “garage friendly,” which means Malibu considered the size of most contemporary garage spaces when designing the boat. The tower folds easily to 7’ 2” on a trailer, to slip in under the door frame. With the swim platform on and the trailer tongue folded, the entire package measures 22’ 10”. Remove the swim platform and that dimension shrinks to 21’ 6”. The boat is available with either a single- or dual-axle Boatmate trailer, too. That it fits in your garage is a plus, but the real draw is what it does on the water, and it’s probably important to start with Malibu’s Surf Gate system, which is available on all Wakesetters. Here’s how it works: using Malibu’s Touch Command screen on the dash (see Digital Displays Dial It In for more on modern tow boat displays and controls), you can activate the system with one button. Extending the portside gate enhances and cleans up the starboard wake, and vice versa. The system eliminates the need to pile a bunch of passengers and water ballast to one side of the boat or the other, and that also eliminates the listing that comes with that practice, which is nice. 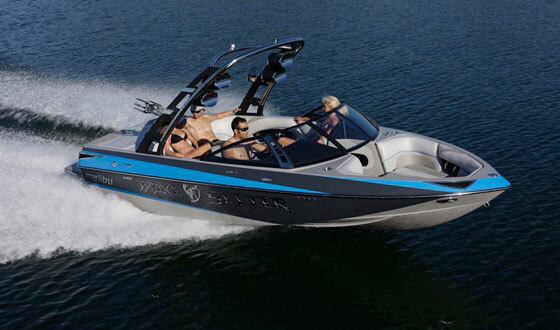 Get the wake you want, thanks to the Malibu Surf Gate system. Wakesurfers love that feature and it really does clean up the lip of the wakes, to make surfing that much better. When not in use, the Surf Gates rest in recesses in the fiberglass swim platform, which is covered with a nonskid rubber mat. The swim platform also has a full-width rear lounge to create a space large enough to allow two wakeboarders to gear up at the same time. Inside the cockpit there’s ample wraparound seating, which conceals stowage and a removable Igloo cooler that lowers into a form-fitting compartment. The cushion above the cooler is supported with gas struts—no more trying to hold up the cooler lid and the cushion while fishing a can of Coke from the ice. 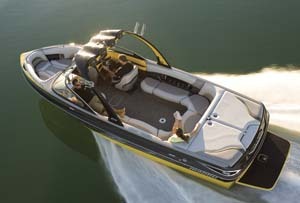 Another nice aspect of all the stowage Malibu thought to include in the Wakesetter 20 MXZ is access. For example, the compartment under the observer’s seat also is accessible from the bow area. There’s additional stowage on the starboard side, just behind the bow backrest cushion. No, this isn’t really groundbreaking, but it is something you don’t usually get in a 20-foot watersports boat. The Wakesetter 20 MXZ also has an anchor locker at the front of the bow lounge. That doesn’t sound like much either, but an anchor is as much a safety item as it is a convenience, and if you don’t have a good place to put one, you might not bother to bring it along. The bow lounge itself is made more spacious through the pickle-fork design, which has become a dominant motif in tow boats in the last couple of years. The increased seating capacity can let you bring more people along. And more people add more weight, which is important to wakeboarders and wakesurfers alike. The bow also has a ladder and that opens it up as another point of entry to the water or when beached. The helm of the Malibu Wakesetter 20 MXZ is as modern as they get. The helm, however, is probably the sweetest seat in the boat. 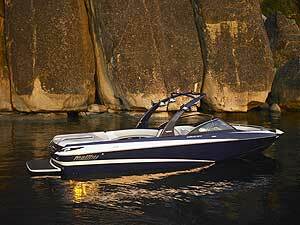 Malibu’s “coachwork” has always been tops in the industry and the Wakesetter 20 MXZ is a real treat. 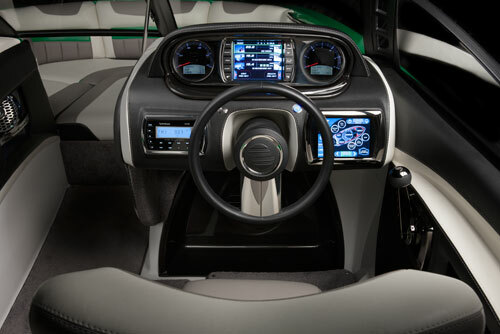 The thickly bolstered seat positions the driver so that the analog gauges and digital display in the middle are in plain sight, and so that the stereo controls at left and the Touch Command panel at right are within easy reach. Central to it all is the very Citroen-like — and very cool — single spoke steering wheel and the richly padded dash, with French stitching. All this top-shelf stuff, naturally, does not come cheap, and the boat will cost you around $90,000. 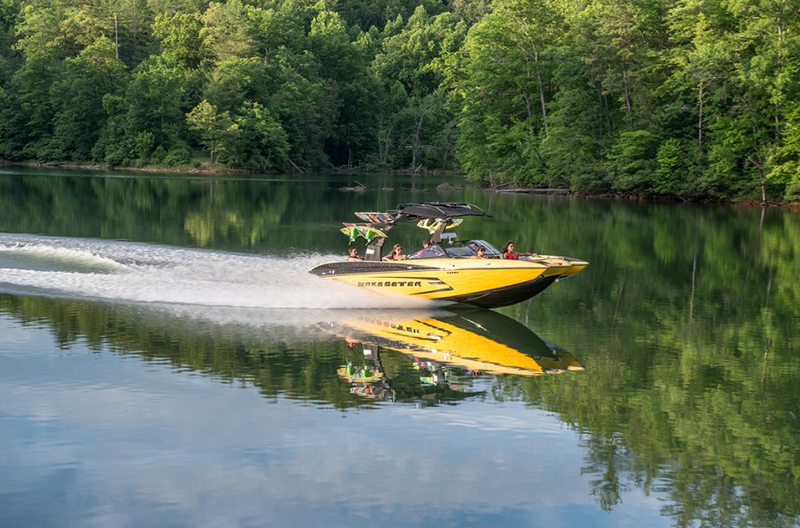 But when you think about all the features and options the Wakesetter 20 MXZ has, you tend to wonder how Malibu fit it all into a 20-foot package. Then again, maybe that’s why the company calls it the little giant. 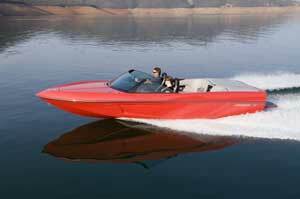 Other Choices: If you're interested in the 20 MXZ, the Tige R20 is another to check out.